iPad presenting is a phenomenon that’s waiting to take off. We have already explored how the iPad 2 and Apple TV 2 combination can make this concept work using AirPlay. Now we come to the last part of the hardware requirements in this post — the part where you connect your Apple TV 2 to a TV or projector. Connecting to a TV or projector that has an HDMI input is a piece of cake — just use a good quality HDMI cable to connect an Apple TV 2 to the TV or projector. Apple’s HDMI cable is very portable and thin, though not too long — if that works for you, then that’s certainly the way to go. My experience turned out to be a little different since my Apple HDMI cable would not work with an Apple TV, a Mac Mini, and also a regular DVD player! I returned the cable — once I receive the replacement, I will add a footnote or comment to this post to let you know how that fares. Right now, I am successfully using a Belkin PureAV HDMI cable to connect my Apple TV 2 to a Sony LED TV. Many new projectors support HDMI input, and some of these also support audio using HDMI rather than just video. I could not find much info on which projectors are compatible with Apple TV’s HDMI output to get both video and audio — projector manufacturers still don’t mention if their products are Apple TV 2 ready. However, there is so much content online on connecting Microsoft’s XBox game console to HDMI capable projectors, and many projector vendors seem to mention XBox compatibility. Fortunately, as a rule of the thumb, XBox compatibility as far as HDMI is concerned does translate to relevance for Apple TV 2’s HDMI output as well. In addition, if you need surround sound, then the projector’s (or the TV’s) sound output will probably not give you the quality you want — you can connect the optical audio port on the Apple TV 2 to an amp or any other surround-capable output. 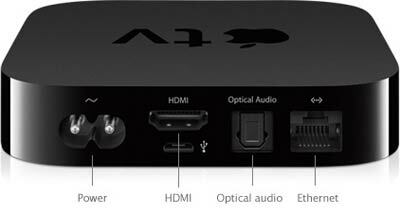 The figure below shows you the ports you can expect to see on an Apple TV 2. There are plenty of threads on Apple’s forums that discuss surround sound output from an Apple TV 2 — here is one of them. Now we come to the part where you want to know how you can connect your Apple TV 2 to a DVI, VGA, or some other input. First of all, I do believe that DVI is the only other option worth considering — and that too because adding a adapter from HDMI to DVI still retains a digital signal, and does not change it to analog. If you must connect to an analog input source such as VGA, then you must not consider wireless presenting from the iPad. The ideal solution in that case would be to forego an Apple TV 2 and connect the iPad straight to a VGA input using Apple’s iPad Dock Connector to VGA Adapter. However, you may have a perfectly capable projector that you do not want to replace — and even then, you should consider those older projectors only if they support DVI input. Also remember that DVI by itself will only be capable of video and will forego any sound altogether. You can still use the optical audio port on your Apple TV 2 to access sound, but many presenters are quite happy to deliver an iPad presentation without audio. Before you rush to buy an HDMI to DVI adapter, you must make sure that the HDMI end of the adapter is no wider than the HDMI port of your Apple TV 2 — anything thicker will not fit into Apple TV 2’s HDMI port since the power input is located right next to the HDMI input (see figure earlier in this post). The best HDMI to DVI adapter that I found is actually Apple’s own HDMI to DVI cable that they provided as part of Mac Minis that shipped in 2010 — but they don’t sell it in the retail chain! The figure below shows how the Apple’s HDMI to DVI adapter looks like. So which HDMI to DVI adapter should you get? Make sure you get one that has a cable in between the HDMI and DVI ends! iPad Presenting 05 – What is AirPlay?